Castec Motor Services Wolverhampton, not only provides a full range of garage services for all makes and models of vehicle but we specialise in prestige cars, namely Mercedes Benz, Rolls Royce and Bentley. 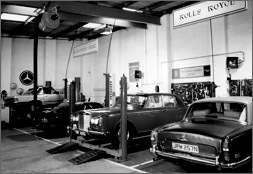 Servicing – Mercedes Benz, Rolls Royce and Bentley services carried out to manufactures service scheduals. Have a Timeless Rolls Royce? Own a Luxury Mercedes Benz? Where we come into our own is if you have the benefit of owning a Mercedes Benz or a Rolls Royce luxury car. Due to our history of being trained by these companies we are able to offer tailored garage services for these vehicles. Using us you will receive the same high quality, level of care and attention to detail as you would expect from the main dealers, but with a major difference – we give you change!! Rolls Royce £75.00 p/h, 4×4 £75.00 p/h and Mercedes cars £70.00 p/h. Enquire now as to how you can save money.